Dream Analysis: Notes of the Seminar Given in 1928-1930. London: Routledge, 1111. Book. Good. Hardcover. Edition Not Stated.. 240mm Tall; 8vo. First given in Zurich during the 1920s and 1930s, Jung expounds his views in seminars on psychology, his analytical methods, society, the individual, religion and more. With Index. 757 pages. Previous owner's ex libris stamp on front free endpaper along with name and address in ink at top corner. Dust jacket worn at edges with small chips and tears, and overall is rather grubby. Page edges are stained with splashes of brown on all three sides. This book is extra heavy, and may involve extra shipping charges to some countries. Paperback. New. 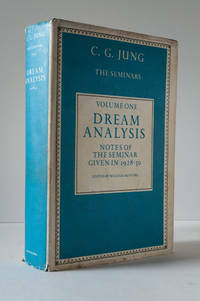 Provides clarification of Jung's method of dream analysis. Based upon a previously unpublished series of dreams of one of Jung's patients.